Most homeowners avoid regular garage door maintenance because they are under the false assumption that it usually takes several hours to complete. In reality, although there are various levels of depth you can go into, even simply inspecting the condition of your door and its components on a regular basis can help you avoid a lot of potential accidents. Keeping your garage door in a good condition will positively affect the security and safety of your home. It will be well worth your while to spend some minutes checking various parts of your door. It could end up saving you a lot more time in the future. Your opener is what allows your door to open and close automatically. You should check its exterior condition to make sure all the electrical wires are properly connected. It is also important to test your remote controls are working fine and that their batteries don't need to be replaced. Last but not least, you should make sure the safety sensors are properly aligned and facing one another. If they've become misaligned, they may be unable to detect an obstacle in the door's path. Much like the railroad that guides the path of a train, your garage door tracks make sure the door's "wheels" otherwise known as the rollers travel along a safe designated path. If your door gets off track, it can fall down and seriously hurt anyone standing nearby. Galvanized variations of these components can resist rust, but they still need to be cleaned on a regular basis to make sure they don't become blocked by dirt and debris. However, these components can get out of alignment, in which case your door could get stuck and a professional's assistance will be required. Bent tracks can sometimes be repaired, but if the damage is too severe, then replacement will be required. A loose cable that got off the drum, or one that has become too frayed can be cause to alarm. Not only will your door be unable to open, but replacing the damaged cable on your own will be dangerous. To avoid this, you should check the condition of these components and make sure they don't get too worse for wear. The same goes for the springs. Obviously, any component that's under such a high amount of tension on a daily basis will develop wear and tear damage over time. The key is to catch things early and prevent them from getting worse. Regular spring lubrication is another thing you can do, as it will allow them to operate more smoothly and efficiently. It's really, the most important thing. Don't try to perform any complex task by yourself. 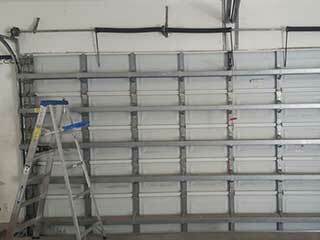 Unless you are a professional garage door technician, you should let the experts handle any major issue you discover. Our team at Garage Door Repair Lawrenceville are here whenever you need us.